Ron Morrow was appointed Advisor to the Governor in July 2018. In this role he is focused on advancing the Bank’s strategic objectives relating to retail payments and other financial market infrastructure issues. He is also responsible for leading several initiatives to explore potential improvements to the efficiency of the Canadian financial system. Ron represents the Bank on the Basel Committee on Banking Supervision and is the Chair of the Bank’s Pension Fund Investment Committee. 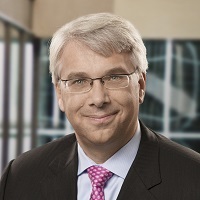 Mr. Morrow began his career at the Bank of Canada in 1992 and has worked in a number of different areas related to monetary policy and the Bank’s financial market activities. In 2010, Mr. Morrow became Managing Director of the Bank’s Funds Management and Banking Department, a position he held until his appointment as Managing Director of the Financial Stability Department in 2013. Born in Thunder Bay, Ontario, Mr. Morrow received an honours bachelor of arts degree in economics, with a minor in mathematics, from the University of Waterloo. He also holds a master’s degree in economics from Queen’s University.